If you have a small quantity of documents to shred you have some options. Drop your papers off at nearby drop off shredding center and pay by the pound, have a mobile shred truck stop by your location, or shred your documents yourself. Each shredding method has its own pros and cons. 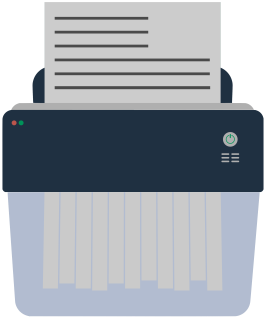 The video and transcript below give an overview of what to expect from each shredding service type so you can make an informed decision when you shred your documents. What Are the Small-Quantity Options? How Long Does It Take to Shred? On site starts with arranging for a mobile shred truck to come to your location on the scheduled date and time. The first step for drop off shredding is finding a location near you—often found in UPS and other shipping stores. Personal shredding starts with initial research and purchasing of a shredder. Equipment considerations need to include overheat frequency (8 min average), cooling time (45 min average), and sheets per minute (typically only a few sheets at a time). When the truck arrives, the shredding technician counts your boxes and takes the containers to the truck where they’re lifted into the shredder. The process is complete in 15-20 minutes. After arriving at a nearby drop off location, your boxes are weighed and then placed in a locked security bin. You also are able to store the contents personally for extra reassurance. To protect delicate rotating shredder knives, sheets typically need to be fed into the shredder a few pages at a time. During the process shreds accumulate quickly—typically requiring the shred bag to be changed 3 times per file box. None—you are presented with a certificate of destruction and the shreds are recycled. The security bins are finally picked up and shredded by a mobile truck or taken to an off site shredding facility. Bags filled with paper shreds need to be disposed. Because of their small size paper shreds need to be taken in to facilities to be recycled separately. To throw shreds in the trash instead risks them being stolen by dumpster divers who reassemble shreds. Shred Nations’ partners have over 5,000 locations across North America capable of handling small volume shredding projects. To find the drop off location nearest you or for free quotes on on site shredding services in your area, call us at (800) 747-3365 or fill out our form. We look forward to helping you protect your private information.